It took a little bit longer to come back than I'd thought it would.. but the Collection has taken over my life in the last few weeks, leaving little room for anything else. I hope everyone had a good start into the New Year, and wishing you a happy, peaceful and joyous 2017! At the end of the holiday season we went on our first family trip with a dog, which made it an adventure for all of us. The challenge was to find places to stay and things to do that could be equally enjoyed by DH and me, our teenage DS and the little Milo! Barcelona seemed an obvious destination since it was easy to reach and the weather forecast promised blue skies. Our trip was planned pretty much last minute, and I felt so lucky that we could still book into the chic and pet-friendly Claris boutique hotel a block away from the Passeig de Garcia. The Claris's owner also owns the Egyptian Museum across the road, to which hotel guests have free access. His son did the hotel's interior design and created a beautiful atmosphere by mixing modern furniture and fixtures with antique sculptures, paintings, furniture and decorative objects from his father's private art collection. The Passeig de Garcia's plane trees were still clinging onto their autumn leaves, but Gaudi's Casa Battló was decked festively with fun and quirky clusters of snowballs hanging from its windows and balconies. The Reserva Iberica ham bar would have clearly been Milo's Barcelona favorite, but he had to wait outside. It is one of the best places to buy the famous Spanish Ibérico ham, and you can also enjoy it right there and then... they have a few tables and bar stools where you can sample the different kinds, along with a glass of chilled Cava. The finest of the finest Ibérico ham, the Bellota (acorn in Spanish). The Bellota producing Ibérico pigs spend their days roaming happily in family groups under the oak trees and rooting for herbs, grass and of course bellotas, their favorite food. The new Crystal earrings (made by hand and matching the Crystal Cluster Necklaces) arrived just in time for New Year's Eve. Barcelona is a tremendously lively city with so many vibrant quarters that it's easy to forget that you're right on the Mediterranean sea. The beaches and ports are lined with cafés and restaurants, and on the weekends people meet friends on the beach, go for walks on the shore, play beach volleyball or get together with their families for a picnic. It was indeed the perfect place for the four of us to spend a day! The weather continued mild and warm, and it could just as well have been an early spring or summers day. We started off at the Port Olympique, where a row of restaurants along the beach path invite you to have lunch on their pretty terraces overlooking the sea. We settled down at the Agua, where simple fresh seafood and mediterranean cuisine was brought out in charming and relaxed surroundings. The Port Olympique's bronze whale. Walk west from there, and you come to the Agua and many other restaurants and cafés. You can continue your walk after lunch towards the One Ocean Port, and find plenty of entertainment and things to do along the way. Sunset with palm trees.. who could resist taking a pic! 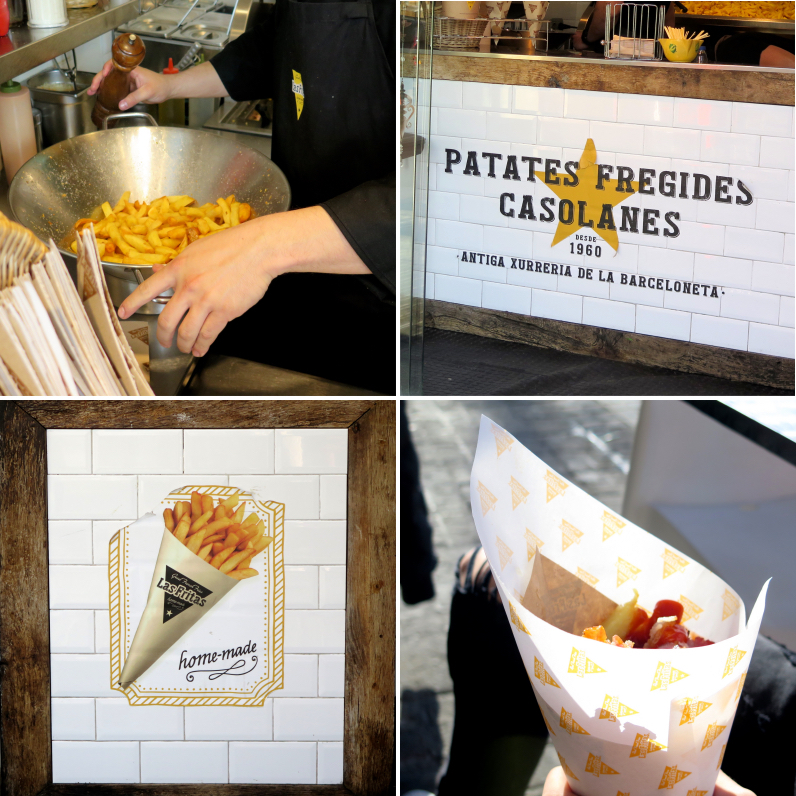 Once you get to One Ocean Port, you are very near to Las Fritas, one of DS's favorite places in Barcelona. He's tried and tested it on many occasions, and it has his definite seal of approval. I have to agree, the hand-made Las Fritas chips are amongst the best I've ever had. Even though the Passeig de Gracia has beautiful shops, I did the best shopping on the way home. After half an hour on the road back to France, you go past the La Roca Village. This time we stopped.. the night before I googled the brands on offer.. all of us found something of interest in this chic outlet village! I came home with some beautiful Max Mara sweaters, which will keep me cosy and warm throughout the rest of the winter. Will there be summer ever again? You are right, these are the happiest and most precious moments indeed, to be remembered forever. Milo says woof and merci! What a lovely description of your travels. Milo looks so chic in his sweater. My Border Terrier Monty was very interested to read about the Jamon shop. I explained dogs are not allowed inside but he says he will wear a jacket and hat so he will pass unnoticed.. Thanks for all the great pictures and tips from Barcelona. I am planning a trip late spring this year so I think you have giving some new inspiration. By the way, how was it travelling with Milo? When you for instance were in a restaurant, were you worried he would be uncomfortable or that even someone would take him? We love dogs, but don't have one yet, but I am thinking about how we would have to adapt to the dog and small things you have to consider like leaving the dog outside. Thanks! So cute ear muffs, by the way. You are very right to consider carefully about adding a dog to your life...the changes are huge. Travelling with Milo was no problem, he is very small and quite well behaved :) I would never leave him unattended outside a restaurant, super market etc ...dogs do get snatched, unfortuntely. 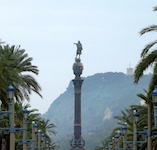 Have a great time in Barcelona, spring is a wonderful time to visit! Thanks so much for the kind comment, Myrtille and Stefani! Have a wonderful week! I laughed when I noticed that Milo's outfit was perfectly matched to yours! You both look so chic. How lovely you could get away for a few days to beautiful Barcelona and with perfect weather, too. 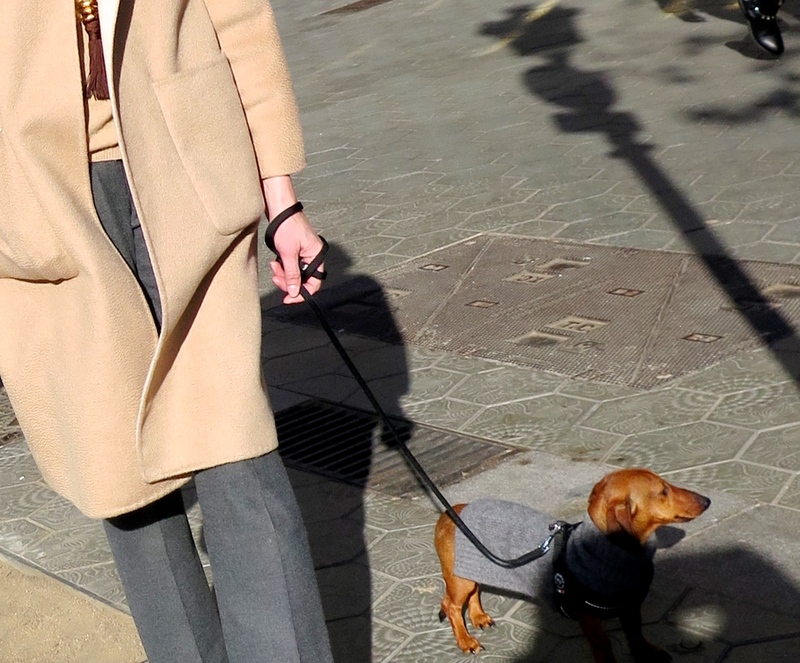 I'm sure that little Milo sniffed his way all over Barcelona, and I hope that he got at least a small taste of the jamon. I'm with DS, though - the fabulous frites looked too good to pass up. If I'm going to have a "cheat" food, it's got to be French fries - very good ones, please! 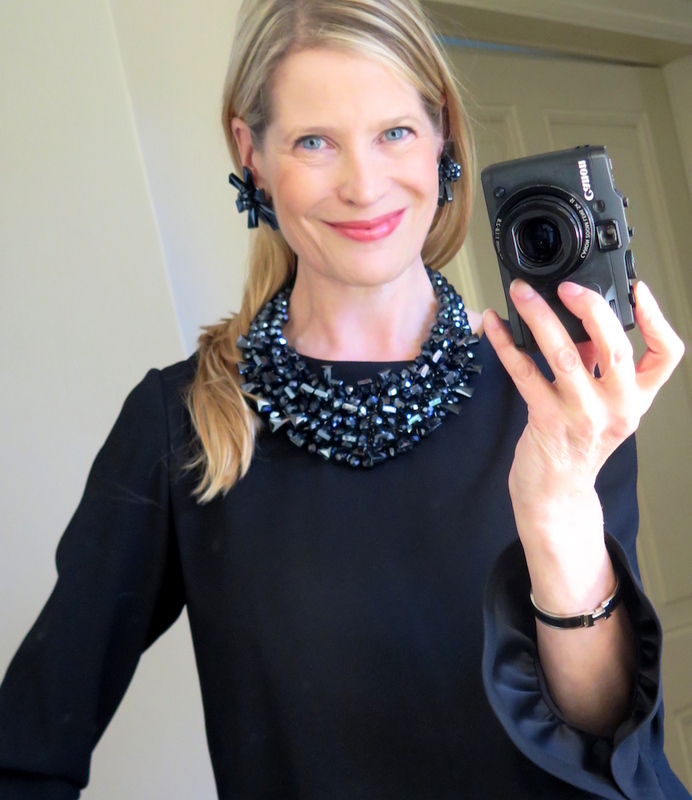 Highly envious of the beautiful Max Mara cashmeres, although, with temperatures here in the mid-70's, I wouldn't be able to wear them anyway. 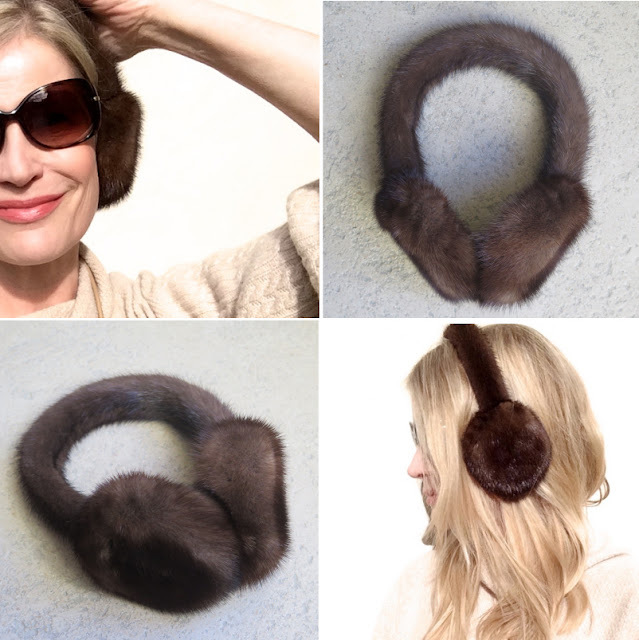 The mink ear muffs are adorable. Will Milo have a matching pair? Darling Jerrine, your comments always make my day! Your writing is so elegant, warm and witty - wish I could write my blog this way. I do admit that I packed a lot of grey and beige, and was happy that the mocca tassel of my necklace matched his coat so well. If only H could bring out a Wiener color next! As for earmuffs.. I was thinking of a Sherlock hat? So happy to have you back, dearest MaiTai- and you once more surpassed my expectations and hopes...what a perfect day to go on a journey to Barcelona and to the beach, even if it's only in my mind! Yes, traveling with a dog has some traps- the little ones are not welcome everywhere. 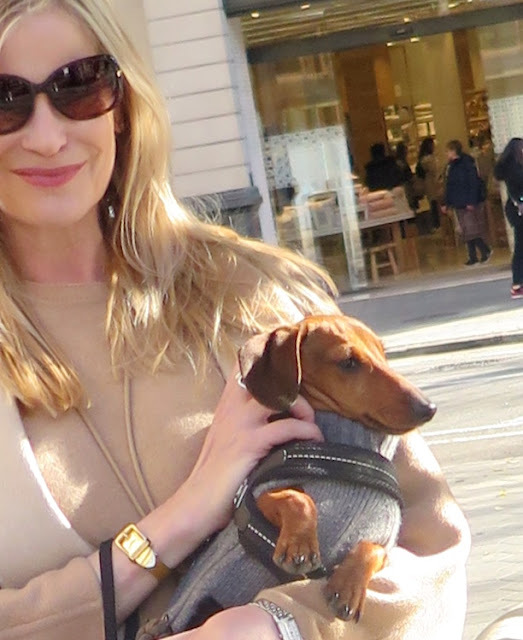 Lucky for Milo that you can still carry him on your arm- he is definitely a very stylish accessory! Finally wanted to order my pebble necklace- but maybe it's better to wait for new surprises? Thanks for sharing and all you energy you put into this! So happy you enjoyed the post, many thanks, dearest Katja! It'll be interesting to find out how Milo will affect our future travelling, and which places work and which don't. Barcelona was very easy, particularly since it was winter (not sure if he would have been allowed on the beach in the summer). France is luckily very dog-friendly, and since Milo is going to stay petite, I hope things are going to work out in other place too! Good morning MaiTai, and thank you for sharing your travel notes as usual. I drop into your blog whenever I have time, and this morning I am at home, enjoying some delicious coffee and panetonne, and planning travels with my family for the coming year. Our own DS now at university, and will he or wont he wish to holiday with us? The challenge to find a holiday with something for everyone. I used your notes from Barcelona last summer, and what a super time we had, so thank you for all your top tips! Enjoying your capsule looks as always! How time flies by with family life changing, as our daughter will be off to university in a little over a year! Best wishes for a most happy new year. Oh I can't believe that your son is at university and that your DD will be following so soon! DS is spreading his wings too... how fast all the changes are. So happy you had a great time in Barcelona last year. How about Berlin or Amsterdam for 2017? Both are such great places, with something to do for everyone. Have a most wonderful and happy 2017 too! LOVELY GET AWAY with MILO!DID I tell you I have a new 8 years old neighbor with the same NAME!!!!! !HE SINGS OPERA and speaks ITALIAN!MAKES ME HAPPY!YOUR ear muffs look wonderful..........I must go PEEK at the earrings! Wonderful, so many great news! How fantastic to have your precious Milo living right next door, and what a relief that it has finally rained in California. I was quite shocked to see LA looking so parched last summer, hopefully all will be back to green and lush in no time. Have a fabuous week! So nice to read about your holiday in Barcelona, dear MT. It is wonderful when a trip hits the fun button for all! I am sure that little Milo has been dreaming of his beach ball days with his new buddy! 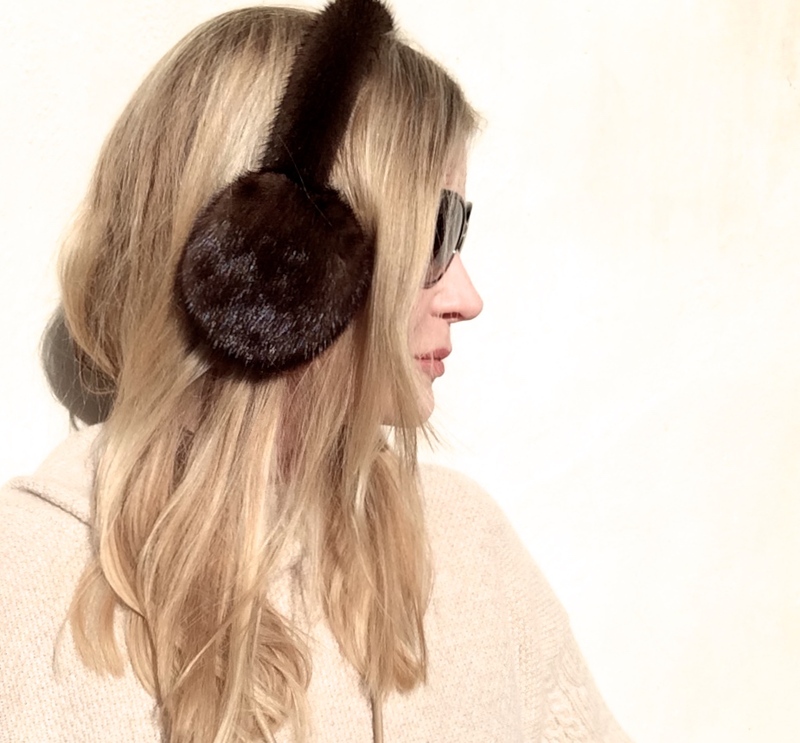 Cute, playful shots with the earmuffs and I love the contrast with your flaxen mane! 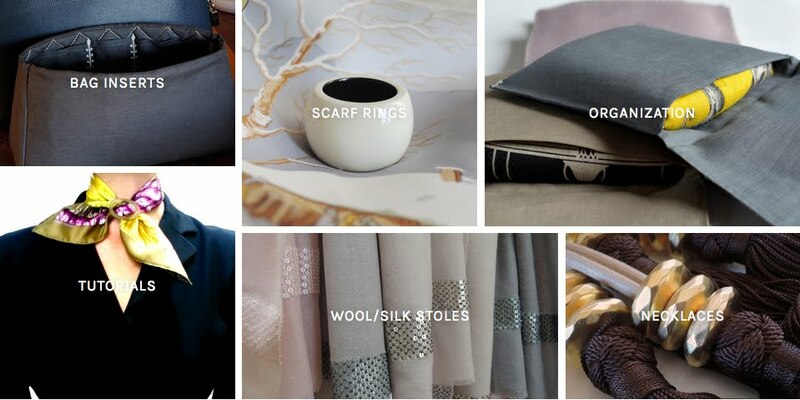 Your Max Mara sweaters look yummy and I look forward to seeing them in action. Barcelona lost his charm.... I pay the same for taxi, crossing town for my X ray concerning my operation.... Unfortunately it has changed a lot Barcelone. Cheap, cheap. So pity i love this town, his bar, etc... And jamin of course! Completely agree with you on the coat, wouldn't put it on unless it's much cooler. Until then, it's just a little sweater ;) On the other hand, I don't think Barcelona been has robbed of it's charm...we had a most lovely time. You could always try to visit outside the main tourist season..
We went for a Chinese dinner at Claris... A bit darker but very good. Your trip to Barcelona seems to have been a very pleasant one and your pictures are beautiful! I love your travellogues. Wishing you a happy and cosy Sunday. I'm late to the party, as usual, but I love the fun snaps of Barcelona and Milo. You take such glamorous holidays! Congratulations on the new items--the earmuffs are divine! Oh and I am even later to re-join the party...bringing bottles of Cava and plates of Iberico ham with me, hola! first of all a very HAPPY (belated) NEW YEAR and all the best to you and yours! It's been far too long since I've been to Barcelona. I've only ever gone in December, when it was freezing cold here and there we were able lo sit in the cafés by the beach with a couple of glasses of Cava, some nibbles and hours of fun with friends. Your new little family member is cute. We have one of those in our family too, her name is Eva and she's a mad little dog, chasing every rabbit that comes close.